TLDR: As of February 2, 2017, the policy of the vendor that Google Domains uses for .io domain registration is that an .io domain is auto-renewed or deleted 3 days before the expiration date displayed in WHOIS information and the Google Domains dashboard. This means that your “real” expiration date is effectively 3 days earlier than you might expect. While there are email notifications at the 30 and 7 days prior marks that list the “real” expiration, there isn’t any obvious indication in your dashboard and only the email seems to mention the “real” expiration date. In 2015, Google launched Google Domains (Beta), which positions Google as a domain name provider. On February 4 2016, I registered an .io domain with Google Domains (smokie.io) to try out their service and because my current domain provider DreamHost didn’t support .io domains (they now do). As the year went on, I decided to use this extra domain to learn Jekyll (a static website publishing tool) and play around with a flexbox portfolio site. I logged into my dashboard again on February 3 to finally renew the domain for 2 years, only to be shocked when my dashboard said my site had expired on February 4, and had been deleted on February 1. I had to confirm through my phone, my computer, and my family that it was, indeed, February 3. So I did what a normal person would do: I contacted customer support. My support person, Ann, was excellent and if you have to contact support I think you’ll have a good time. Unfortunately, my problem couldn’t be resolved the way I wanted it to be as it’s a limitation of the provider Google uses for .io domains. I could either restore the domain for the normal renewal fee and an additional expiration fee or I could wait for it to release (roughly 3 months later) and re-register for the normal registration fee. 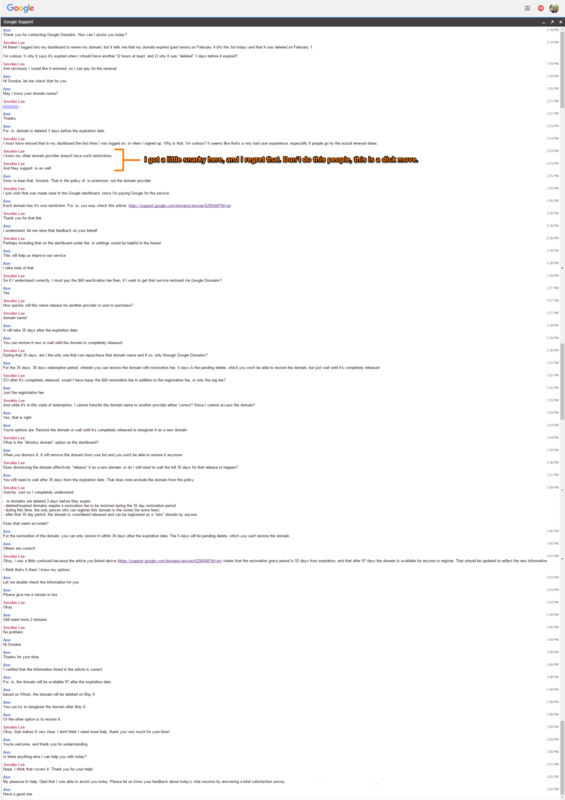 Here’s a screenshot of the entire conversation; click it to view a larger version. I didn’t like that I couldn’t save a copy of the customer support chat from their interface (or it wasn’t obvious if I could), but I did like that the text formatting was preserved when I copy and pasted the entire chat log. Unfortunately for users – and ultimately Google Domains – this “real” expiration information isn’t apparently shown in the dashboard; if it is, its not prominent enough to be noticeable. Because this date is different than what is listed on WHOIS information, I believe this information should be much more “in your face” for users. Google Domains seems to me to be tyring to appeal to a broader consumer base, so more communicative UI and a crystal-clear UX are necessary to remove the gap between the technical skill of users and the technical knowledge needed to complete the domain tasks. Not every user will be a domain expert, and some of these newer top-level domains (TLDs) with different registration rules just add to the potential confusion. I did receive an email (that Google Inbox helpfully decided was a “promo” and bundled away to the Inbox vortex) at 30 and 7 days with the expiration date of February 1, so the email notifications are a great user experience, assuming that end users get the email (in my case, it’s not Google Domains’ fault I didn’t receive the email). When I signed up for an .io domain, I was likely told about this odd expiration policy, but just ignored it, as I’m sure many users do. Because (I assume) Google wants to retain users on their service, it only benefits them to make it as easy as possible to renew the domain and prevent users from losing access to their domains by expiration and deletion. Of course, I might be wrong about the lack of prominence of the “real” expiration date in the dashboard prior to February 1; I didn’t take screenshots so I’m relying solely on my memory. Other people might not have this experience at all, or they might believe that the UX surrounding .io domain expiration dates is perfectly sufficient. Still others might think that anything Google does is negative, or even extremely positive. The views and experiences in this post are my own, and I recognize that other people have their own as well. Because this happened to be a usability issue for me, it might be one for someone else as well and every support issue is a usability issue. Ultimately, I decided that in my particular case it wasn’t worth the extra money to pay for restoration/expiration fee. I still think that Google Domains provides a fine service, and I feel like this situation is at least 80% my fault for not being more diligent in making sure I knew the policies and all dates and information associated with the domain. However, any user failure means a “failure” somewhere in a design, even if you can’t fix it (i.e. only that user, can’t be repeated, limitations of tech stack, etc), and it’s important for organizations and users to know where those “failure” points are. Please check out Google Domains to see if their service is right for you!